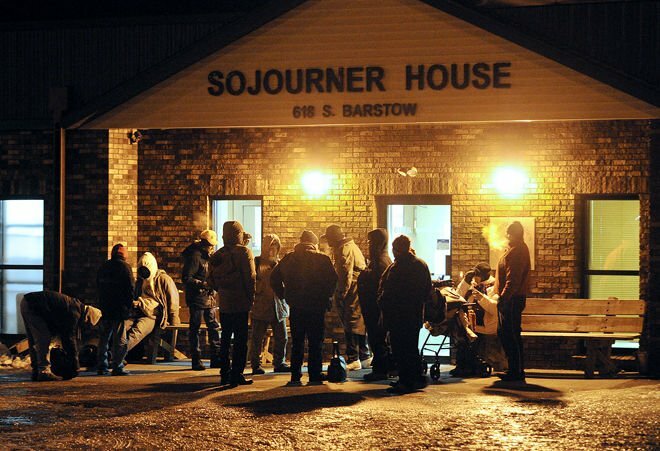 People gather outside Sojourner House homeless shelter in downtown Eau Claire seeking a place to spend the night. The shelter and others in Eau Claire have been at capacity recently, forcing some to spend overnights in vehicles or elsewhere. Local agencies are devising a plan to augment overnight services. Rundown properties like this one are commonplace in the eastern Eau Claire community of Fairchild. A recent study found two-thirds of the village’s population struggles financially. Dani Claesges, the Eau Claire school district’s homeless program coordinator, admires the detail on a crocheted hat, among items donated to the program in 2016. Cleasges says more students and their families are seeking assistance from the district because of financial struggles. When Shawna McPhail relocated from Minneapolis to Eau Claire three years ago, she was hopeful that this region’s lower cost of living would allow her to make a better life for her and her family. But that hasn’t happened for the 36-year-old single mother of two young children. Instead, she continues to struggle financially, despite working one full-time and one part-time job. Today, McPhail pays $750 a month to rent an apartment on Eau Claire’s north side and struggles to pay her bills, much less save up enough money to buy a house of her own. She is part of a growing number of Eau Claire County residents having a difficult time making ends meet financially. More than 4 of every 10 households in Eau Claire County struggle to pay for such basic life staples as food and housing, with many living paycheck to paycheck and one unexpected major expense away from financial ruin, according to a recently released study. The Asset Limited, Income Restrained, Employed, or ALICE, study released at the end of August shows that 42 percent of county households either live in poverty (14 percent) or earn relatively low wages (28 percent), making paying for such costs as health care, transportation and others difficult. The study, conducted by United Way of Wisconsin, is based on 2016 data. It shows that many in the Eau Claire area and elsewhere across Wisconsin continue to struggle financially even as the economy performs well and at the same time as unemployment is near record-low levels. The percentage of Eau Claire County households living below the ALICE threshold is higher than the 37.5 percent figure for the state and tops the percentage in many counties in this part of the state. The figure is even higher — 46 percent — in the city of Eau Claire. The number of people struggling financially has grown, figures show. In 2014, the most recent ALICE study, 40 percent of county households either lived in poverty or met the ALICE guideline. According to the study, the number of county households living in poverty decreased, from 16 percent in 2014 to 14 percent two years later. However, the percentage living above poverty status but still having a difficult time making ends meet grew from 24 to 28 percent during that time. “This study shows that many people in our region continue to struggle, and the problem is getting worse,” said Jan Porath, executive director of United Way of the Greater Chippewa Valley. Eau Claire resident Tammy Schneider knows all too well what it’s like to have difficulty paying bills. The 26-year-old single mother of two children said her jobs as a waitress and part-time sales associate barely cover expenses that include her monthly $700 rent. ALICE study statistics show Schneider is far from alone. To be classified as an ALICE resident, a single adult must make less than $9.68 an hour, or $19,368 annually. A family of four can have household income of no more than $62,736, or a combined $31.37 per hour, above the statewide average of $30.81. Those figures are a sign of the rising cost of living in the Eau Claire area. Prices for housing, health care, food and child care eat up larger portions of the budgets for many people, according to the ALICE report and interviews with county residents and agencies that work with people in need. Studies show Chippewa Valley residents pay the highest health care costs in Wisconsin, and gasoline prices here typically are among the costliest statewide. Housing costs have increased sharply in recent years, with the average rent in Eau Claire nearly doubling during the past decade to $800. The problem, McPhail said, is many jobs in the Eau Claire area don’t pay that well, and what pay raises some people receive often don’t keep up with the rising cost of living. Statistics back up McPhail’s observation. According to the ALICE study and other statistics, the cost of living in the Eau Claire area has grown substantially during the past decade, outpacing inflation. Like many of the people she knows, McPhail said she makes more than the federal poverty level ($11,880 for a single adult, $24,300 for a family of four, based on 2016 figures) but not enough to always pay her bills on time and certainly not enough to put money into savings after paying food, housing, child care and other expenses. Those who work with people in need in the Eau Claire area said McPhail’s story is a common one. The ALICE report serves as an important indicator related to public health issues, said Lieske Giese, director of the Eau Claire City-County Health Department. Studies show that people having problems making ends meet tend to have more poor health outcomes than people of economic means. A growing number of Eau Claire school district students and their parents are seeking assistance from the district, a sign of economic struggles many in the Eau Claire area face, said Dani Claesges, the district’s homeless program coordinator. “We have a lot of families who reach out to our staff members looking for help meeting basic needs for such things as clothing, hygiene products and school supplies,” she said. Claesges said she wasn’t surprised at the ALICE study results, given what she sees at her job and the fact that 39 percent of Eau Claire school district students receive free or reduced meals, a sign their families earn relatively low incomes. More students qualify for those meals but decide not to receive assistance, she said. Eau Claire school board President Joe Luginbill called the numbers spelled out in the ALICE report “heartbreaking” and said the community must do more to recognize the struggles many face and then enact policies to improve those people’s lives. Higher numbers of working poor in the Eau Claire area is notable in part because that trend is occurring during a relatively strong economic period. Unemployment is at a historically low level, economists say, and businesses throughout the Chippewa Valley say they struggle to find employees. Many said they have boosted wages to find workers. Current surveys of local wages show average pay raises locally of more than 3 percent each of thepast two years, saidScott Rogers, governmental affairs and workforce director for the Eau Claire Area Chamber of Commerce. He said he wonders whether ALICE figures have been improved upon since 2016 because of that. Jeanne Semb, housing services coordinator for Western Dairyland Economic Opportunity Council, said many in Eau Claire lack the training and education to obtain good-paying jobs. While Semb and others know of some cases of workers receiving higher pay and better employment opportunities, many others have gone without salary raises for years, either in the same position or as they have bounced from one low-paying job to another, she said. Despite a relatively strong economy, more workers are experiencing difficulties making ends meet in part because of the types of jobs available in the Chippewa Valley and elsewhere in Wisconsin, statistics show. According to Bureau of Labor statistics from 2016, nearly 2 million jobs in the state pay less than $20 an hour, with just over 1 million of those $15 an hour or less. The total number of jobs in the state is just under 3 million, meaning two-thirds of them pay $20 an hour or less. Rogers hopes those numbers can be improved upon locally and across the state with an increased focus on job training. Those efforts and higher wages being paid in the region hopefully will improve figures in the next ALICE report, he said. In many ways Eau Claire, most notably its downtown, is a vibrant place. New development has sprung from its once-dormant city center, with apartment buildings and storefronts replacing old, partly vacant former sites. The gleaming Pablo Center at the Confluence arts center is scheduled to open Sept. 22. Eau Claire is well-known around the state and Upper Midwest as a thriving hub for the arts, recreation, health care facilities and educational institutions. Yet, nearly 1 of every 2 of the city’s households experience difficulty affording the new opportunities the city offers. For many, taking part in those activities isn’t possible. As he increasingly encounters people hurting financially, Luginbill can’t help but notice what he calls the “two Eau Claires.” One is thriving and prosperous, providing more opportunities to enjoy the city. The other receives far less attention but comprises much of Eau Claire’s population. Discussions about affordable housing, the city’s growing homeless population and other poverty-related issues are becoming more commonplace as local nonprofits and various organizations work to address those topics. Luginbill and others said they hope such efforts can make inroads to reduce those meeting the ALICE report standard.